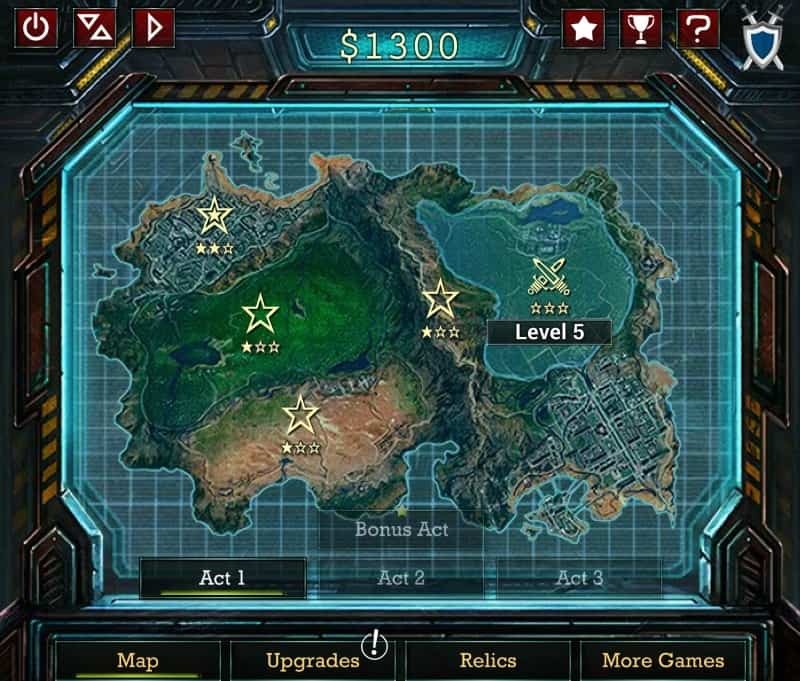 Stellar Squad is a free online strategy game in which you command a squad of futuristic soldiers and fight off wave after wave of robot attacks. The game plays similarly to Tower Defense games but with the difference that the positions of your soldiers are set. Stellar Squad is a tactical game that features squad-based combat, different unit types, upgrades, and an army of robots of all shapes and sizes. Combat works automatically but you get control over certain things while it plays out. A click on an enemy robot focuses fire on it for example but your unit acts on its own for the most part. You earn energy when you defeat robot squads and may spend it to upgrade a unit member during the battle. All start out as basic soldiers but can be promoted to space marines, heavy gunners, forcers or medics to name a few of the available classes. Each class has distinct abilities. The medic sends out drones to heal squad members, the heavy packs a punch and the forcer shoots with a railgun. But there is more that you can do. Each class brings along with it a special attack. The heavy fires a stun grenade, the space marine commands a rocket strike, and the medic may put a protective shield around each squad member for some time. These specials have cooldowns and it is up to you to make the most out of them. Your last option is to add defensive shields or attack power ups to individual squad members. Defensive shields protect against direct attacks, power ups increase the damage output. You earn money when you play maps in the game and may use the money to upgrade individual classes or the squad itself. Upgrades to the Marine, for example, improve the rocket barrage or increase the damage of the marine's weapons. While you could spend all money on squad or unit upgrades, you may also spend some on relics. You discover relics during battles and they are added automatically to free relic slots. These improve certain characteristics or things automatically, for example, a 5% attack increase or replacement soldiers for fallen ones. Relic upgrades improve these further. You control the game on a strategic map. The game features three regular acts and a bonus act, each with a set of missions that you play through to advance the game further. Once you beat a mission on normal, you unlock the challenge and when you complete it, you get to play the wave again but this time in hard mode. Battles play out in real-time automatically but you control unit upgrades, focus fire, and the use of special weapons and specials. A hit on the space-key pauses the battle. This is probably the most important thing you do during battles as they can get quite hectic. You start with a certain number of hearts in each battle and lose hearts when robots manage to enter the ship. The battle is over when you lose all hearts or defeat all enemy robots that advance on your position. You do earn some money when you lose a battle but not nearly as much as when you win it. Still, you may spend the money on upgrades and try again. There is no limit on tries but the money that you earn from battles is reduced after you win a mission for the first time. Stellar Squad is a good looking squad-based strategy game that plays in all modern browsers that support Adobe Flash. It is a fast paced game and gets quite hectic at times, but you can mitigate that somewhat with heavy use of the pause function. 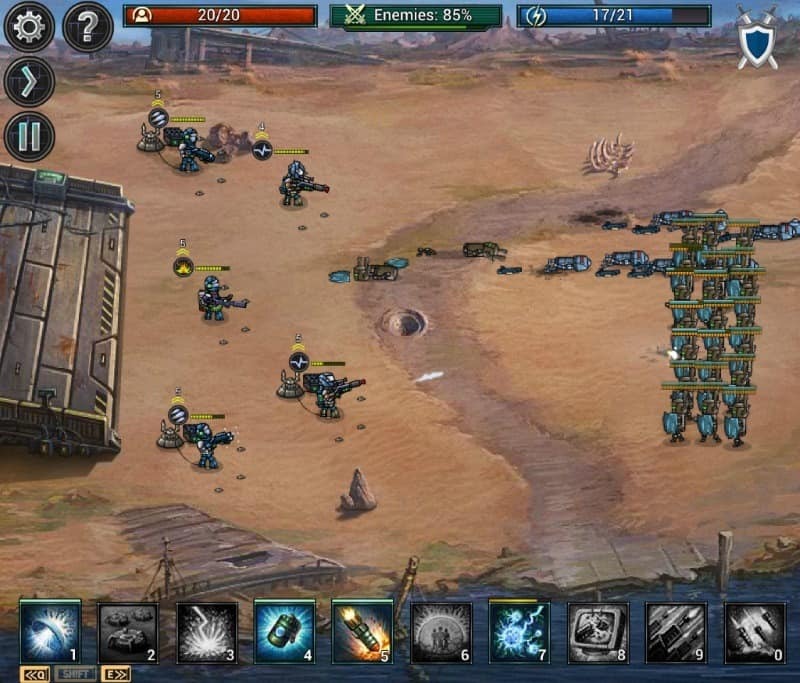 If you like tower defense and strategy games, you will certainly enjoy Stellar Squad as well. Now You: Do you play online games? Seriously? Isn’t there enough violence in the real world? I stubbed my toe the other day. That was enough violence to last me for the rest of the week. Great game for those idle moments at work. I spent a lot of time playing it already. “Oh no! We could not detect that Flash was enabled for your browser. This game requires Adobe Flash to play, so please install or enable it if you wish to play.” HTML 5 the game and i will play. Flash is a malware.